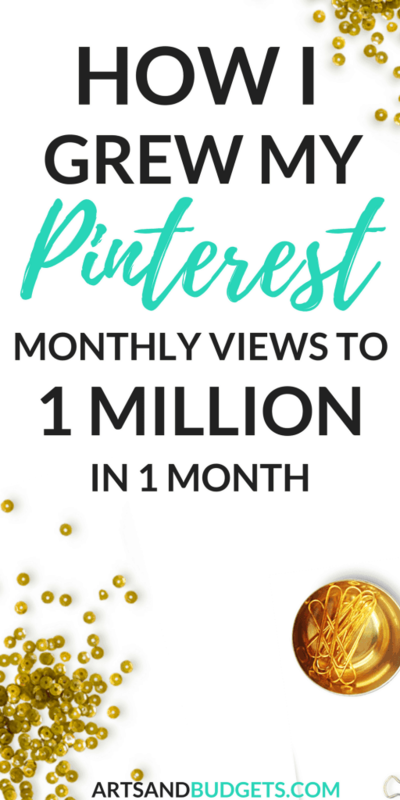 How I grew my Pinterest Monthly Views to 1 Million in 1 Month! Are you looking to take your Pinterest game to the next level or looking for new ways to boost your ranking on the platform? If so, this post is for you. #WooHoo! For the last 4 weeks I have implemented some new techniques into my Pinterest strategy and to my surprise, it’s working! For the longest time I was stuck at around 600,000 monthly Pinterest views and then something changed. After changing a few things in my strategy on the platform I reached 1 million monthly Pinterest views in ONLY 3 weeks! I was so shocked how fast I hit 1 million that I had to write a post about how I did. What does 1 million monthly Pinterest views mean? Your monthly viewer reach is a part of your overall reach on the platform, which is HUGE. It’s possible readers that can see your pins in their smart feeds which could mean more traffic being directed to your site. As soon as I see an increase in my Pinterest reach I also saw an increase in my traffic on my site. I normally average around 1000-1500 pageviews per day on my site but after my increase on Pinterest, I started seeing 2000+ pageviews per days which are pretty darn awesome to me as I head toward my goal of 100,000 by the end of this year. I was super shocked up because my site traffic/ pageviews went up as well. So this post will share some ways you can increase your Pinterest rank and grow to over 1 million monthly viewers! One of the quickest ways to gain movement on Pinterest is to treat it like a search engine. Towards the end of last year, I started treating Pinterest like a search engine instead of a social media platform and my traffic and engagement went through the roof. Since it’s important to treat Pinterest like a search engine it’s also important to focus on SEO known as “Search Engine Optimization”. SEO, also known as search engine optimization are strategies and techniques to increase the number of visitors that come to your website by obtaining a higher ranking on search engines such as Google. In order to treat Pinterest like a search engine, it’s important to put keywords in your pin and board descriptions so that your pins and your profile can become searchable on the platform. After you post a new blog post repin it from your post on Pinterest and update the pin description with relevant keywords. I currently also add a few hashtags to my pin descriptions which also help my pins get categorize with other relevant pins. From my experience Adding keywords and hashtags helps with boosting the SEO on my Pinterest pin descriptions. I find relevant keywords right on the Pinterest search. Simply go to the Pinterest search and type in possible keywords that you might use for a blog post title(s). For example, on Pinterest, I typed in the keywords “How to Start Blogging” and the Pinterest system populated other relevant keywords that I can use right in my pin description. This method makes it easy to find other popular keywords that you can in your pin description and also use for other posts. Another awesome place online to find good keywords to add to your Pinterest pins and boards descriptions is Google keyword planner. Simply go to a Google search and type in “Google Keyword Planner“. When you get to the set up make sure to click on “ Skip the guided set up” option since you only want to use the platform for the keyword planner. I share a ton of details on how to treat Pinterest like a search engine and where to put your keywords in this post. Towards the end of last year, I started to really focus on jumping on the actual Pinterest site to spend time on it. There are 3 ways I spend time on Pinterest daily. Manal Pinning: I started manually pinning a lot of my pins and found out that it totally helped my ranked on Pinterest. So I put it apart of my main Pinterest strategy. When I manual pin on Pinterest I pin my best-performing pins from google analytics to different group boards and to my personal board daily. If you aren’t sure how to find your best-performing pins on Google analytics, check out this post. Pin Other Pinner’s Content: I also take about 5-10 mins to search my smart feed to find other relevant posts that fit in with my niche and repin some of those pins to my boards. I absolutely love looking through my feed on a daily basis to find new pins so it’s actually fun for me. Repin some of my repins: I also take some time out my day and repin some of the pins other pinners pinned to their boards to some of my boards. I simply go up to my notifications and see which of my pins were pinned to relevant boards and repin some of them. Why Spend Time on The Actual Platform? What I have noticed is that Pinterest favors accounts that actually spend time on the platform daily and from my spike in traffic on the platform I truly believe it’s true. I now make sure to spend some time on the actual platform daily because of the increase I saw in my traffic on Pinterest and my website. I go into more details about this and my full method in my new course Pinterest Superhero! 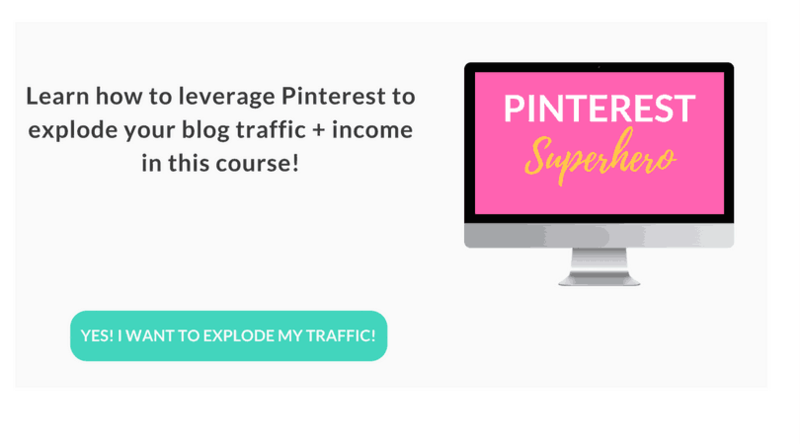 The Pinterest Superhero course covers my exact strategy on how I grew my traffic from ZERO to over 65,000 monthly pageview month and how I went from making zero a month to over $1500 a month right from Pinterest! The course also goes over my SEO strategy, Manual Pinning strategy, and more in full detail in video tutorials and written lessons. Check it out here. This is huge! From my experience, most bloggers gain success on Pinterest from their actual pins so you want to make sure your pins stand out in the crowd. Create Vertical Pins: Normally vertical pins stand out more than horizontal pins in the Pinterest smart feed. So, I normally create my pins in Canva and create them 1000 X 2000 in size. This size has worked great for me thus far. So, test out some vertical sizes and see which ones work best for your brand. Brand The Pins: On your actual pin make sure to include your brand colors and fonts. Also, make sure to put your website somewhere on the pin so that users will start to learn your brand on your Pinterest pins. Below is an example of one of my Pinterest pins that have done really well on Pinterest with my branding. Add A Catchy Title: This is also a big one. When creating titles think about how you can help your audience achieve something. Most people get on Pinterest to find answers so I make my pin titles “solutions”. For example, a lot of my “How To” posts do extremely well on Pinterest. Example of one of my “how to” post is also listed below. In this post title, I am let my readers know that I will help them learn how to grow their blog traffic by using Pinterest. So, think of ways you can help your audience and think of titles that focus around helping your audience find instant solutions.You can also add numbers to your titles as well. 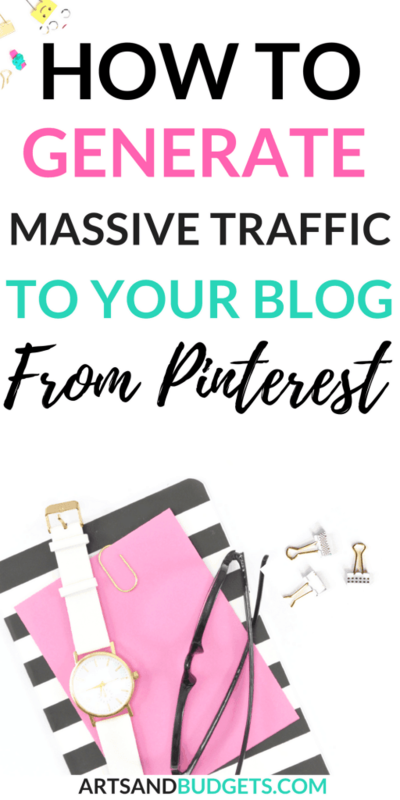 An example of this type of post title would be “10 Ways To Grow Your Blog Traffic This Month On Pinterest”. Posts that include titles with numbers in them like the example above also tell the readers that they will learn something new and gain possible solutions. Oh! Yeah! Get it on Facebook, yo! If you haven’t already make sure to join some promo threads to promote your pins daily. Most Facebook groups have promo days where you can share your latest Pinterest pins in the promo threads. The promo threads are also good for finding new relevant content to pin to your Pinterest boards as well. Ok! This was new for me this month (Jan 2017) even though I have used Tailwind for over a year now. After really diving in tailwind tribes I found out that they are truly beneficial for giving my website traffic a boost from Pinterest. 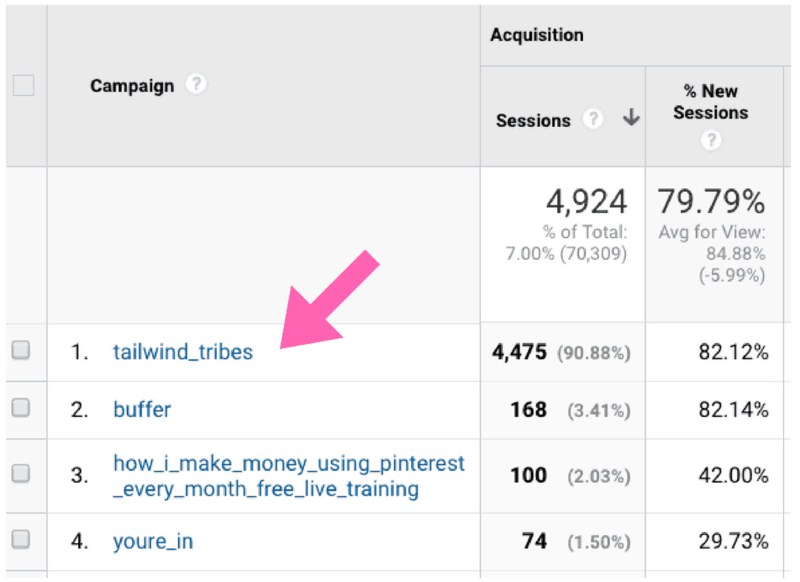 I recently checked my google analytics and noticed that some of my Pinterest traffic came from Tailwind tribes. I was shocked to see Tailwind Tribes was number one in my campaign section for generating traffic to my blog. After seeing that I added Tailwind Tribes to my Pinterest strategy! —Talk about mind blown! Because of that, I started to focus on Tailwind Tribes and even join Tailwind Tribes Power up Elite which is unlimited Tribe Membership and I get to submit to 400 tribes per month. I am going to test the Elite membership out next month and see if I see double the increase at the end of the month. I will also keep my readers updated on the progress! #HiFive! To find out your top campaigns go to Google Analytics then >Acquisition > Campaigns > All Campaigns! Before that, I only posted on Tailwind tribes about 2 to 3 times a month. This month I tried something different and posted at least 4 to 5 times per week and I noticed that some of my traffic from Pinterest came from Tailwind tribes. Tailwind Tribes are groups of bloggers and online business owners who exchange repins in a group on Tailwind. Once you get invited to a tribe you will be able to pin your pins to the tribes and find other relevant pins in the tribe to pin to your boards. Seen below is an example of a tailwind tribe looks once you accept or get accepted into one. 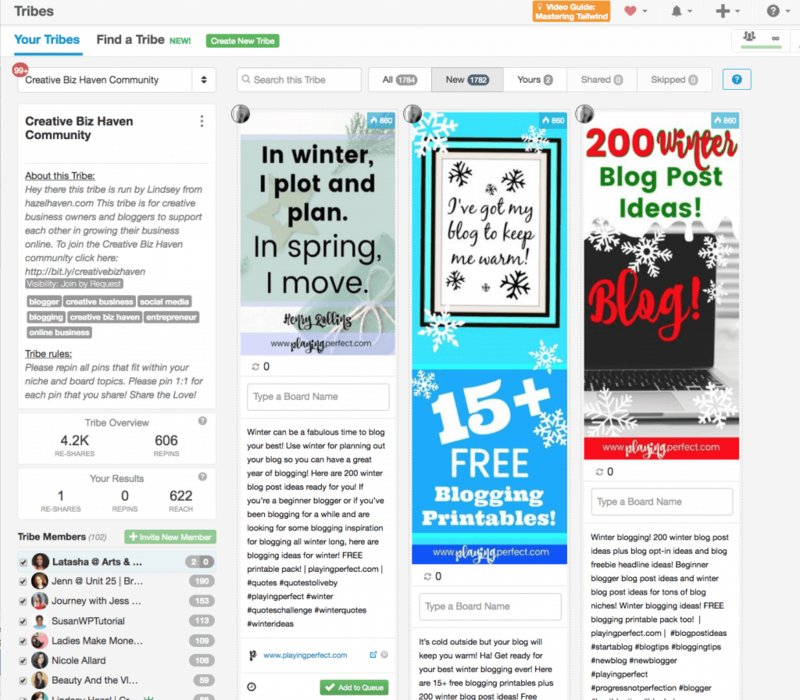 If you are looking for some Tailwind Tribes to join some awesome Tribes that I am a part are Creative Biz Haven Community Tribe,, Bloggers Killin It On Pinterest and Blogging Tips! So there you have it over 6 how I grew my Pinterest monthly viewers to 1 million! How are you rocking your Pinterest presence this month? Can’t wait to implement these tips! Great informational post! This is fantastic advice! I think I might print this out and use it as a checklist! Thank you! LOVE this post! I came across many of your posts on Pinterest before and they have been super helpful. I also joined a facebook group that you recommended in one of your posts, and told the admin you referred me via your blog. I am working so hard on my Pinterest and it can be totally overwhelming!!!! I definitely need to repin my repins more! I always overlook that when I’m in pinning content! Great tips on Pinterest! I took a course at the beginning of my blogging journey 1.5 years ago and also saw similar results! It’s a search engine! I need to be more intentional in growing my Pinterest views. This is most helpful. I will be adding it to my regular routine. Wow! That’s amazing! Interesting because I’ve just published a similar article on my blog today. I love Pinterest. It’s my favourite social media platform and the main traffic source to my blog. And pinning is never borring 🙂 Congrats! ONE MILLION? I thought I was impressive with about half that. Good for you!! And thanks for the tips to help us get up to where you are!! Thanks so much for this post! As newbies, this is great info for us. At the moment I am going back to basics and making sure my boards are inline with my focus. These are all amazing tips! I need to start focusing on SEO. Pinterest is the way to go. I notice a lot of my blog traffic comes from pinterest also. Great tips. It is refreshing to see a post that is not pushing automated Pinterest ideas. I do understand it’s importance but right now I am working with what I have and can afford. Thank you for your ideas. They are certainly helpful. Wow these tips are super helpful, I am definitely saving this to come back to over and over again! Great tips and I’ve been using some of these tips for the past month and I can say that it definitely works. One of the things that I’ve been doing every time I get ready to publish a new blog post is I will do some keyword research on Pinterest. Then I will check that keyword in my keyword tool. After all, I don’t want to just optimize my blog posts for Pinterest only. I want to make sure that I am optimizing for Google as well. The cool thing is that when you implement these tips, your Pinterest traffic kicks in a lot quicker than it does with Google. However, don’t forget to optimize for Google. Eventually, as your blog gets older and gains trust in Google’s eyes, you want to make sure that your blog is ready to for Google traffic. Excellent tips and thanks for sharing your success on Pinterest. I can’t wait until I am able to get half that amount of traffic from the platform. I’ve shared your post to help others who are struggling with their traffic. I’ve been feeling quite stagnant lately on Pinterest and my monthly views seem to be stuck around 200k. I’ll try your suggestions and look into Tailwind! In your opinion Tailwind is worth the monthly cost? Great ideas here, definitely helpful for a blogging novice (such as myself). My Pinterest following seems to be climbing slowly, which is exciting. Can’t wait to implement some of these ideas and see what happens! This is a great information. That’s for all the great ideas. I can’t wait to start using these tips. Ok so say I know I have a pin that’s done well on Pinterest…it’s been repinned thousands of times. How do I find that exact pin to start repinning it again? Enstine Muki recently posted…Bloggers make money ~ 15 Foolproof ways to make money blogging! This was such a great post, never thought to repin my repins, but after seeing your amazing numbers, I definitely will going forward! I’m newer to Pinterest so I’ve been creating smaller pins but I ventured into longer vertical pins recently and they really do seem to convert better. I’ll be trying out the pin dimensions you suggested next. Thanks for this!